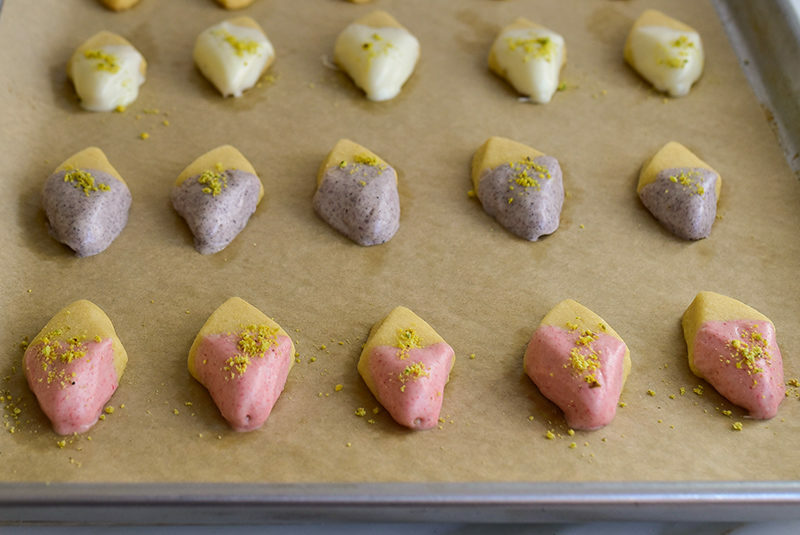 Pastel dipped shortbread are melt-away Lebanese butter cookies, dressed up in a dip of white chocolate, naturally flavored and colored with freeze-dried fruit–blueberry for lavender and strawberry for pink. Try my other graybeh recipes: orange blossom-lavendar graybeh, classic graybeh, and almond graybeh. Find orange blossom water here. I’ve been searching for a whole lotta years for a cut-out cookie I can love. I went through a search for this project, and really ever since, the hunt continues. Must be I talk about it plenty too, because I hold the favorite recipes for cut-out cookies from many a kind friend. 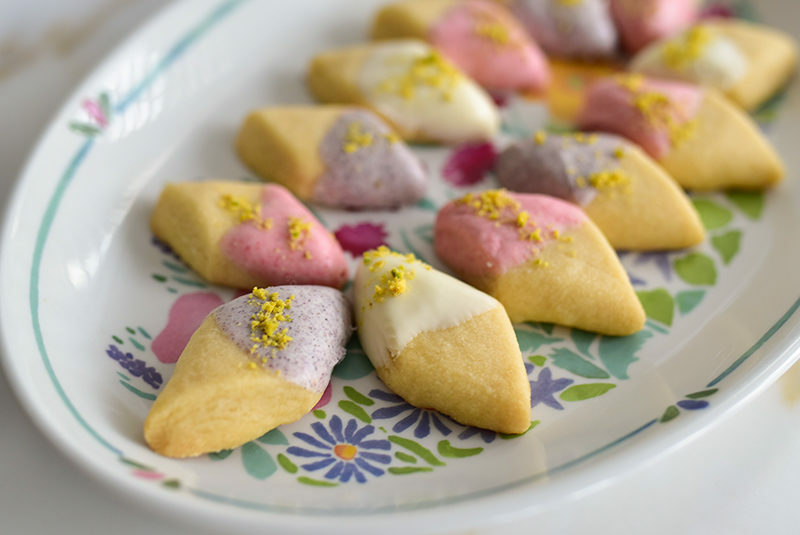 For Easter, I planned to present to you a soft cut-out butter cookie in lovely Easter shapes. They would be frosted in the manner of Martha Stewart’s spring issue magazine cover; such gorgeous little things, so pretty, too pretty to eat. Or, frosted in the manner of my mother, beautiful in a simpler manner, with rich, crave-able buttercream rather than royal icing. Yet . . . I’m always, without fail, disappointed when I take a bite of a cut-out. No matter how lovely the dough, how simple the method, how great the icing. For this, I blame the graybeh, our traditional Lebanese melt-in-your-mouth little shortbread cookie. No matter what style of butter cookie I eat, I compare. And no matter what, I think: gosh, I wish this cookie right here was a meltaway, buttery little graybeh instead. Simply dusted with confectioners’ sugar, graybeh is lovely. But for the Easter dessert table, I’m thinking pastels, spring-has-sprung, He-is-Risen joy, which in my mind = color. Which is what led me to the frosted cut-out to begin with, to jazz up the dessert table with a showstopper platter of spring. Why, then, can’t we gild the lily that is graybeh rather than cut-outs (we are cutting them after all, into diamonds), and cloak our cookies in their own Easter finery? Much as I’m a fan of dark chocolate, this season calls for white chocolate, gently melted. 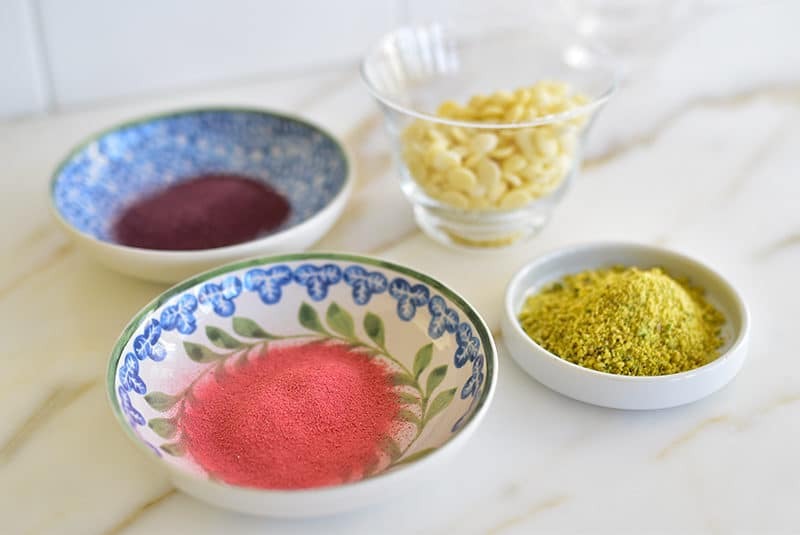 For color and fabulous flavor, we’ll use my favorite go-to fruit flavoring: freeze-dried fruit, pulverized to a powder. Separate little bowls of each color, and dip each cookie, not unlike dipping eggs in their mugs of PAAS dye. Thankfully we don’t have to choose–we can have both colored Easter eggs and pastel graybeh. But if we did have to choose…hmmm, I think I know where I’d land. 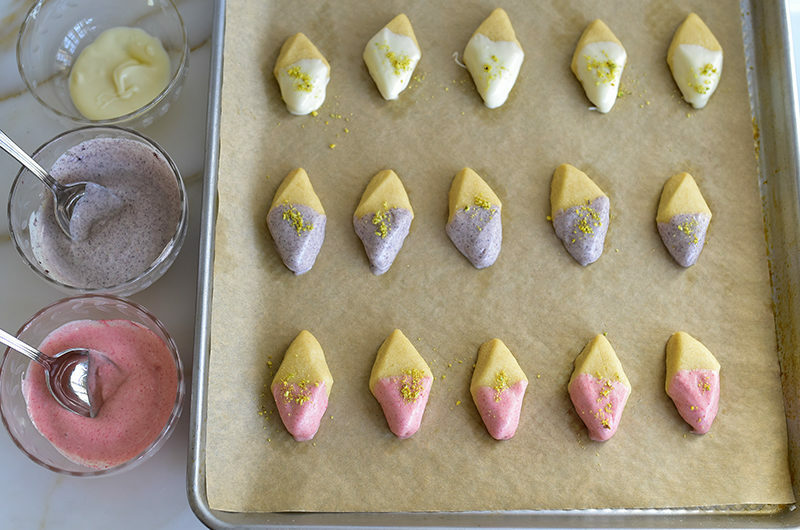 Classic Lebanese shortbread cookies that melt-in-your-mouth are all dressed up for spring, dipped in white chocolate that is colored and flavored with powdered freeze-dried fruit. The coconut oil is added to the white chocolate for a smoother, thinner consistency for coating the cookies. Find orange blossom water at MaureenAboodMarket.com. Try orange blossom-lavender graybeh, classic graybeh, and almond graybeh recipes too. Heat the oven to 325 degrees and place the rack in the center of the oven. Line two sheet pans with parchment or a silpat. 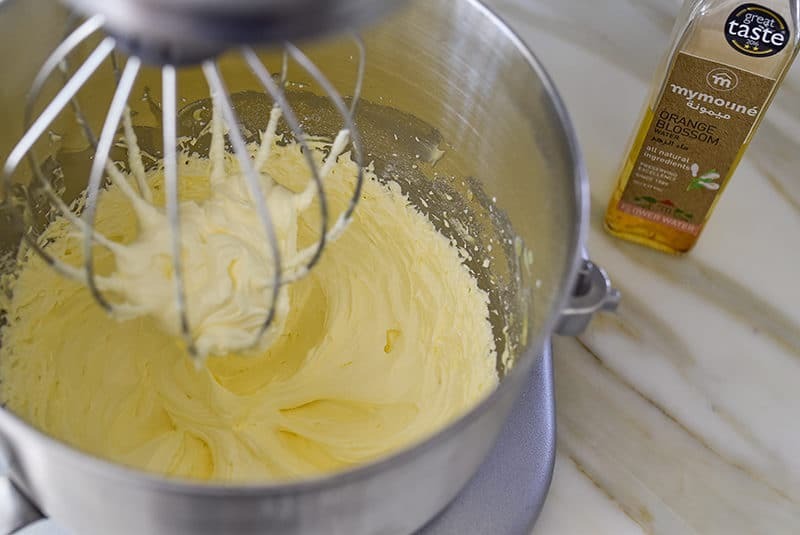 Using a mixer with the whisk attachment, whip the butter on high speed until fluffy, creamy and pale, about six minutes. Stop and scrape the sides of the bowl with a spatula for even whipping. Add the confectioners' sugar, orange blossom water, and vanilla and whip until well combined and fluffy, another 5 minutes. In a small bowl, whisk the flour and salt. On low speed, slowly blend in the flour, ½ cup at a time. 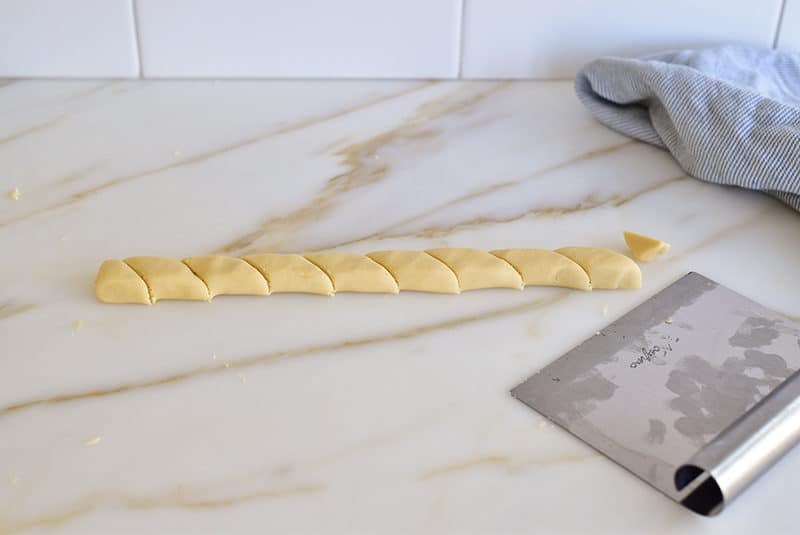 Handle the dough as gingerly as possible to shape the cookies. Knead the dough just enough to form a cohesive dough. Take a large handful of the dough and shape it into a log about 1-inch tall and wide (this is pretty narrow!) on a lightly floured surface. If the dough is crumbly, gently push it together. Use a sharp knife or bench scraper to square off the sides of the log, and to cut ½-inch pieces diagonally (these are quite small; they expand when baked). Place the diamonds on a parchment-lined heavy sheet pan and bake until the cookies are baked through but still pale, about 18-20 minutes. The cookies should not be browned except for very minimally on the bottom. Remove from the oven and cool on the sheet pan. Gently melt the white chocolate chips with the coconut oil in a double boiler. White chocolate is very delicate takes this indirect heat to melt properly. Or, melt the chocolate with the coconut oil in 15 second increments in the microwave. Pulverize the blueberries until they are finely ground. Sift in a fine mesh sieve. Do the same, in clean grinder or processor, with the strawberries. Divide the melted white chocolate into three small bowls. Add a teaspoon or so of the blueberry powder to one bowl, and the strawberry powder to another bowl. Leave the third bowl of white chocolate as is. Stir the powder and chocolate well, adding more powder for more color and flavor as you like. 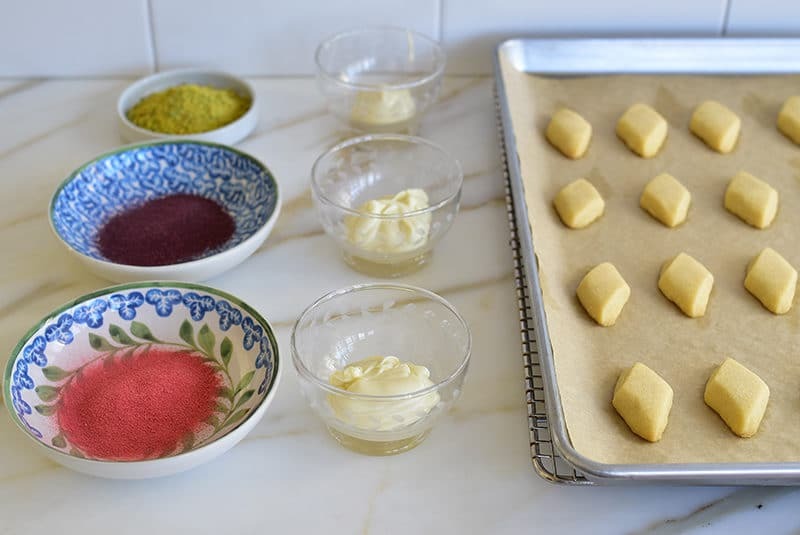 To dip the cooled cookies, dunk the top half of a cookie in one of the colored chocolates, taking care to coat the top only of the cookie for easier drying and handling of the cookie. Use a spoon to assist in coating part of the cookie. Allow any excess chocolate to drip off back into the bowl. 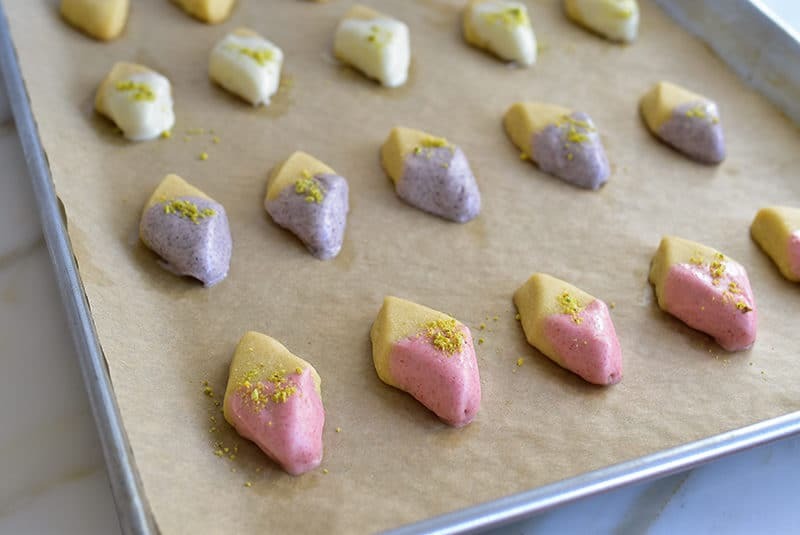 Place the cookie back on the parchment lined cookie sheet and sprinkle with a bit of the pistachios. Dip all of the cookies in this way, with 1/3 of the cookies in the blueberry chocolate, 1/3 of the cookies in the strawberry chocolate, and 1/3 of the cookies in the plain white chocolate. Let the dipped cookies dry for two hours. Serve immediately, or store in a single layer in airtight containers for a day. 4 Responses to "Pastel Dipped Shortbread (Graybeh)"
Very pretty! I finally had success making your recipe for Christmas (after 40 years) of disappointment! Happy Easter to you and your family! Thank you Pat! This is great news! In Canada, we have bulk stores that carry pastel coloured chocolate wafers for baking….they would work just great. Michael’s stores also carry different coloured wafers. I am definitely going to try this.